Mini candy bar wrappers are a great way to bring your party theme to life. Quickly wrap a bag of Hershey’s brand miniature candy bars with these easy Dashing Little Man sticker wraps, then scatter them along your table for a sweet treat your guests will enjoy. Or place them in a bowl at your candy buffet and let your guests grab a few for their goodie bags. 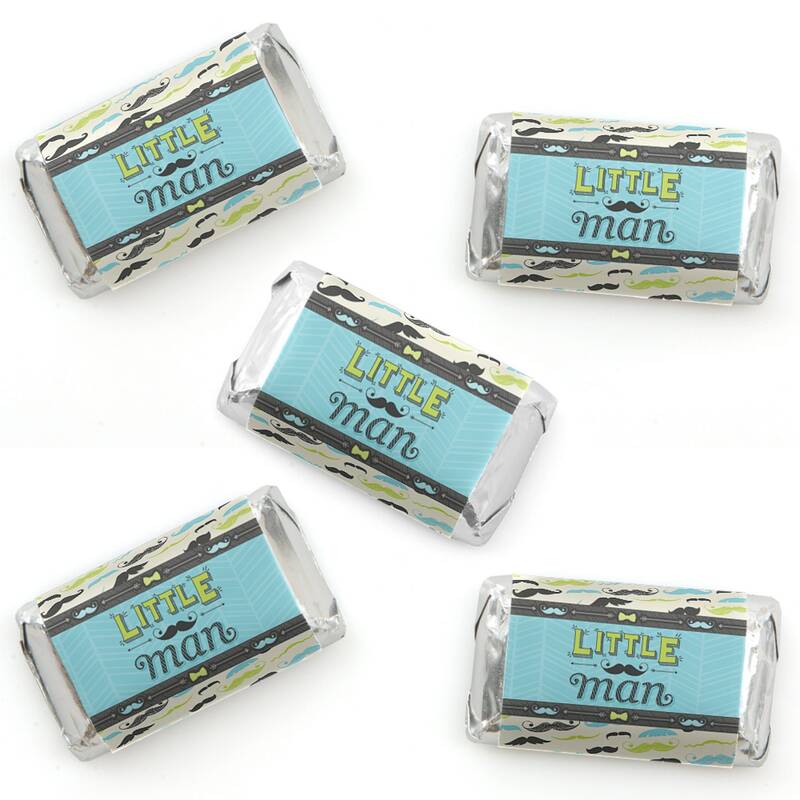 Mustache themed mini candy bar wrappers perfectly coordinate with our Dashing Little Man party theme! Each mini candy bar wrapper measures 1.25” W x 2.75” H and is designed to fit Hershey’s brand miniature candy bars. Absolutely satisfied with my item. Quick shipment, wrapped very professional and enjoyed the updates of communication. Thank you!!! Super cute! Used these stickers on my daughters goodie bags! I will definitely be ordering again soon! 13th Birthday Circle Stickers - Chic 13th Birthday - Pink and Gold - Personalized Birthday Party DIY Craft Supplies - Teen Birthday - 24 ct.
We accept credit card payments using Direct Checkout through Etsy. Buyer is responsible for all custom fees and/or duty taxes on international orders. We guarantee your 100% satisfaction, but understand that sometimes returns have to be made. If the return is being made due to an error on our part, please contact us. We’ll do whatever it takes to make the situation right! This is our promise to you. If the return is being made due to a “change of heart” on behalf of the Hostess Hero, we’re happy to accept your products as long as they are unopened, unused and non-personalized, preferably within 90 days of the purchase date. Unfortunately, we cannot accept returns of food-related items. Simply contact us to confirm the return, carefully package your items, then ship them back to us in a secure box that includes your name and order number. Please keep in mind that we aren’t liable for damage that occurs while your package is on its way back to us. Postage for return shipping is your responsibility. We ship fast... really, fast! We ship all items, even personalized, within 1 - 3 business days. We ship via UPS or USPS, and you can expect to receive your items within 6 business days from when we ship your order. Business days are Monday through Friday, and do not include holidays or weekends. If you need expedited shipping, please message us. If you have ordered personalized items, the shipping timeframe starts when we receive the personalization for the products. If color changes and proofs are requested, this can delay the shipping and delivery timeframe as we cannot ship the order until we receive approval of the proof. The listed shipping rates and timeframes are only for the Continental United States. We currently only ship to the United States. Can I change the color of this product? We can make color changes on most of our party supplies! There is a $3.00 one-time charge for all color change services. PLEASE NOTE: Our Rainbow Unicorn, Sweet Shoppe, Precious Cargo and World Awaits Themes. cannot be customized. Simply follow the link below to add the color change to your shopping cart, along with the item that we are making the color changes to. Next, describe your color changes in the "Notes to Seller" section on the Check Out page. Our design team will then send a proof to the email address connected with your Etsy account. Once we have your approval, we will print and ship. Our typical order processing time is 1-3 business days with standard delivery in 6-8 business days. Please note your need-by date in the "Note to Seller" section to ensure proper delivery.